Seeing that almost every friend of him has one set of electric self-balancing scooter, Tom is fairly thirst for one set of electric self-balancing scooter. Each time he stands away from his friends who are playing with intelligent self-balancing scooters, he feels remorse because he did not buy one set. Therefore, these days, he sets out to purchase one set online. He has never ridden electric self-balancing scooter and do not which model is suitable for him. As a result, he has to turn to his best friend Harry about pick of self-balancing electric unicycle. Today he pays a sudden visit to Harry's. At first, Harry is surprised by his sudden visit. His purpose of coming to his house comes to Harry's knowledge and then Harry becomes delighted to offer his advices. Harry is a veteran players of electric self-balancing scooter. In his house, he has three models, FOSJOAS electric unicycle V6, FOSJOAS electric self-balancing scooter V9 and FOSJOAS V2. He can ride each model expertly and smoothly. Tom is jealous of his skill and having so many models. Harry says to Tom that given he is a beginner, the single-wheeled scooter indeed is hard for him. For him, the twin-wheeled scooter V2 is the most suitable for him. The twin-wheeled intelligent scooter is upgraded on the basis of V6. In terms of performance and ability to keep balance, V2 gains a great improvement. Tom thinks FOSJOAS V9 seems easier to ride. 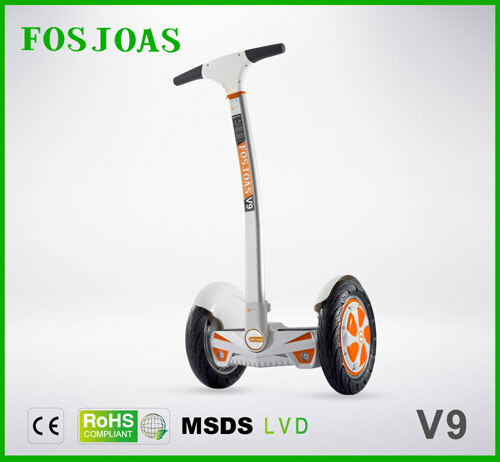 Harry tells him that FOSJOAS two wheel self balancing scooter is used widely in golf diamond or some large plants. On the one hand, it is extremely easy to handle. On the other hand, the ease of use makes a dent in the fun of learning it. FOSJOAS V2 need some efforts of the rider. The rider has to spend some time on learning it. When he successfully learns it, he will enjoy the fun. And nothing can be compared with the delight. At his words, Tom makes up his mind to buy FOSJOAS V2.